This antique dresser started off in pretty rough shape. 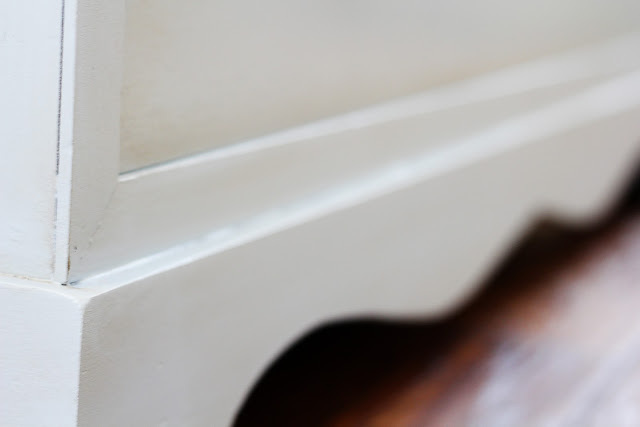 I usually steer clear of anything that requires too much cosmetically because I'm not a huge fan of copious amounts of sanding and filling. Regardless of the condition, this was one I couldn't pass up. I also do my best to reuse original hardware. I find it difficult to recoup the new cost of hardware on most resells if something requires more than a couple pieces. However, with this dresser, there was no way to make the old hardware fit the vision I had for the end result. 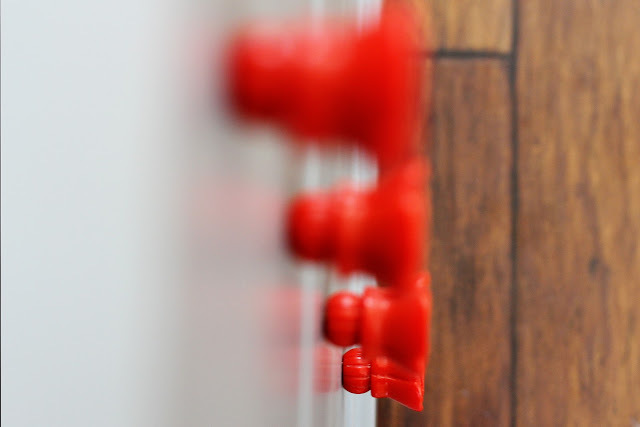 I was fortunate enough to find some blood-orange knobs at Anthro that fit the bill. I'll take eight please. The color is BM Sweatshirt Gray followed by the Wiping Stain used here. 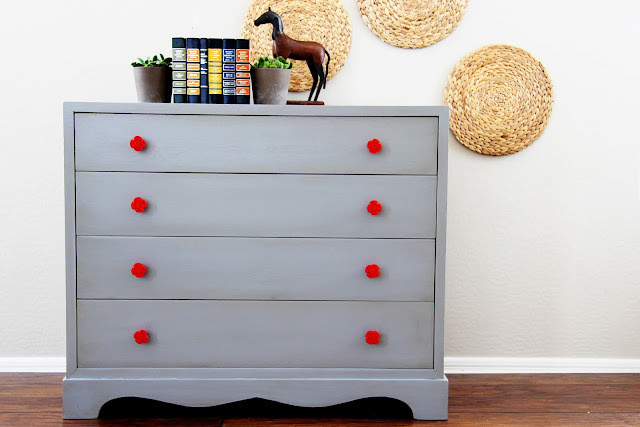 This dresser is up in the shop! 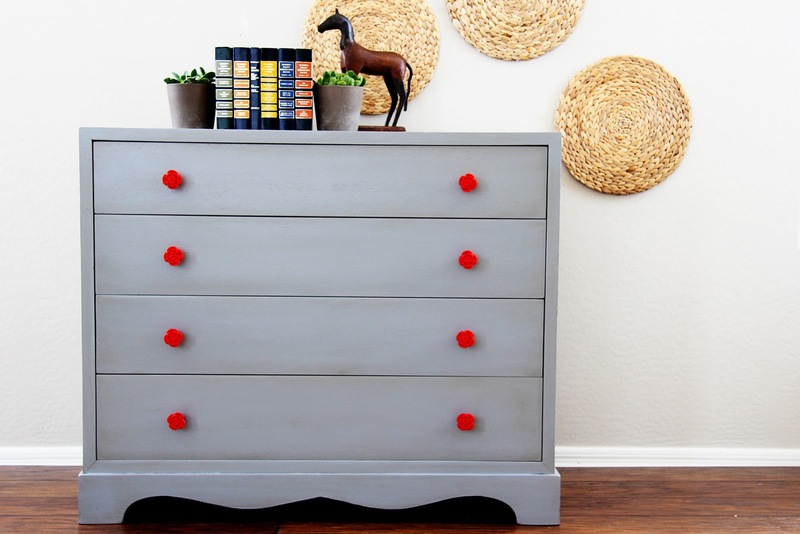 Love the way those orange knobs pop against the gray! Good decision! I love the color combination the glaze is also a very nice touch.....I'm loving your transformations. Beautiful color and the knobs are gorgeous! 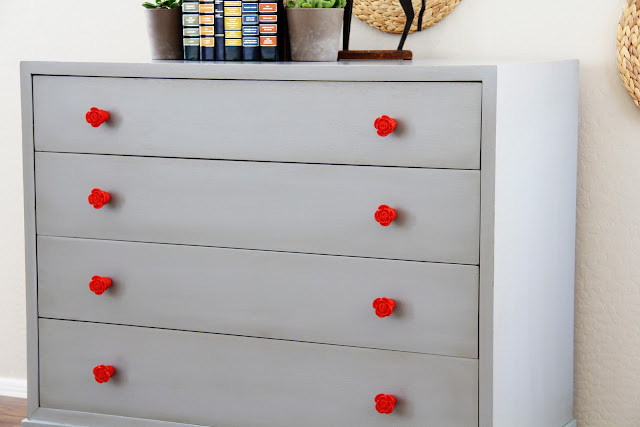 I love this colour and the knobs are so cute! I can't believe it's the same piece - great vision! LOVE this. I am going to get some Sweatshirt Gray this week! LOVE it! What a unique piece! Love it! 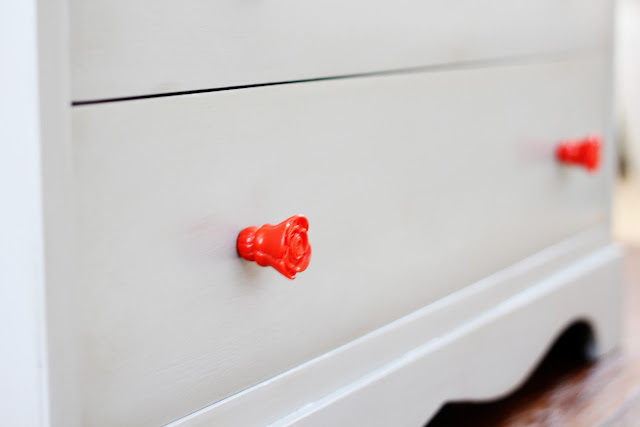 I am in LOVE with the knobs. :) Great touch to the dresser. those knobs are so sweet. how fun! Love this one too! You're so talented! I seriously need to get on the glazing train. I never think to do it myself (too much trouble, wah wah wah) but I always LOVE how it looks! That is a beautiful transformation! Beautifully simple and clean looking with a fun pop of color. Perfect! ha! and i just posted about my anthro kuh-nobs and those were in my i-want-to-buy-them-but-am-overwhelmed. yup, i tend to buy them when i see them BUT never have the right amount for a piece. grrr. after this post, i'm heading back for them!! love the wild side of you! this rocks! This is gorgeous! I love the combination of gray and orange together! Great job! Gorgeous! 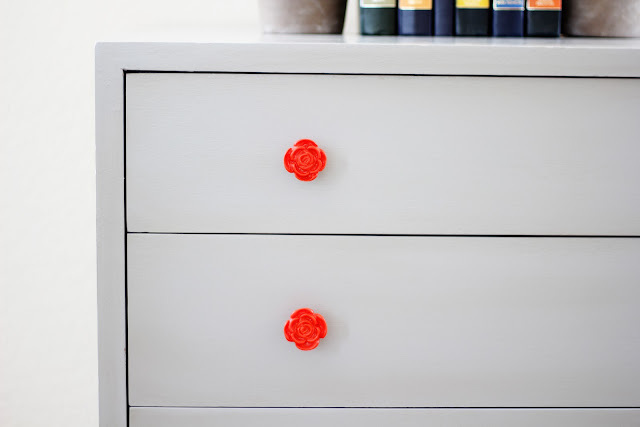 Great colour choices and the shape of the knobs works so well. I love this! Do you mind sharing what paint and color you used for this? I've been loving gray. And those bright knobs from Anthro are a perfect foil. Nice job! Wonderful goods from you, man. I've remember your stuff previous to and you are just extremely excellent. I really like what you've got here, really like what you are saying and the way in which by which you assert it. Someone necessarily lend a hand to make critically articles I'd state. That is the first time I frequented your web page and to this point? I amazed with the research you made to make this actual put up extraordinary. Excellent activity!